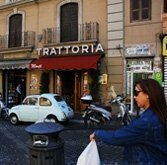 Something about Rome trattorias with mothers in the kitchen and sons at the ready sends Americans into St. Theresa paroxysms. In this Monti spot you have Enrico and Daniele Camerucci and mom Franca. In 2006, New York Times restaurant critic (and former Rome bureau chief) Frank Bruni gushed, “It’s hard to spend more than €50 a person, including wine, for a meal worth more than that.” As for Franca, “she can be depended on for terrific pasta dishes.” Question: What mother di una certa generazione can’t be? Honestly, TM is worthy of praise for its stalwart Marche cooking, which includes tasty rabbit (timballo di coniglio con patate, pigeon, and hen. The tagliatelle with ragù marchigianotakes a cue from the richness of the game itself, since the sauce is almost as ample in texture as the pasta. With fame comes remodeling and the dreaded, “book ahead.” That’s a pity. And beware the place that begins to take itself too seriously. Trattoria Monti — now anointed with the “book ahead” label — must stare down the threat. Oh, and the famous €50 is creeping toward 60.